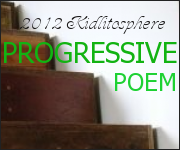 Today I am excited to host the 2012 Kidlitosphere Progressive Poem, brainchild of Irene Latham at Live Your Poem... Thank you, Irene, for inviting us all to a poem party! This poem has been growing each day, one line at a time, traveling blog-to-blog, and deepening with each visit. You can read the whole lineup of contributors in my sidebar (through the end of this month) or over at Irene's first post which introduced and kicked off this project. Each line was written by a different blogger who hosted the poem on his or her writing day. I only wrote a million lines before I finally picked one. Smells of a Moroccan market spill out. last week's dreams. Take a wish from the jar. ...Strains of a waltz. How do frozen fingers play? How do fennel, ginger, saffron blend in the tangine? The last line is mine, and now I pass the wish jar to Lori at Habitual Rhymer where she will continue the unfolding. Oh, your line is perfect...it knits the poem together beautifully and lifts the spirit of it somehow. Well done! What Tara said! We've moved away now from the sorrows to a lighter place... thank you, Amy, for this loveliness. A continual unfolding and shifting of light... loving this "experiment"! Great job "word-herding," Amy. Go, Amy! Way to tie everything together! What Robyn said about word-herding! Yay, it's coming around, tying up loose ends, perhaps the seeds of a resolution have been planted... Lovely! Now you've given the first piece of advice, just like a group would. I wonder what other wise words from women will appear! Terrific, Amy!